Now that I’ve discovered I’m expecting a little girl, I have suddenly become a devotee of the humble but beautiful pastel palette. 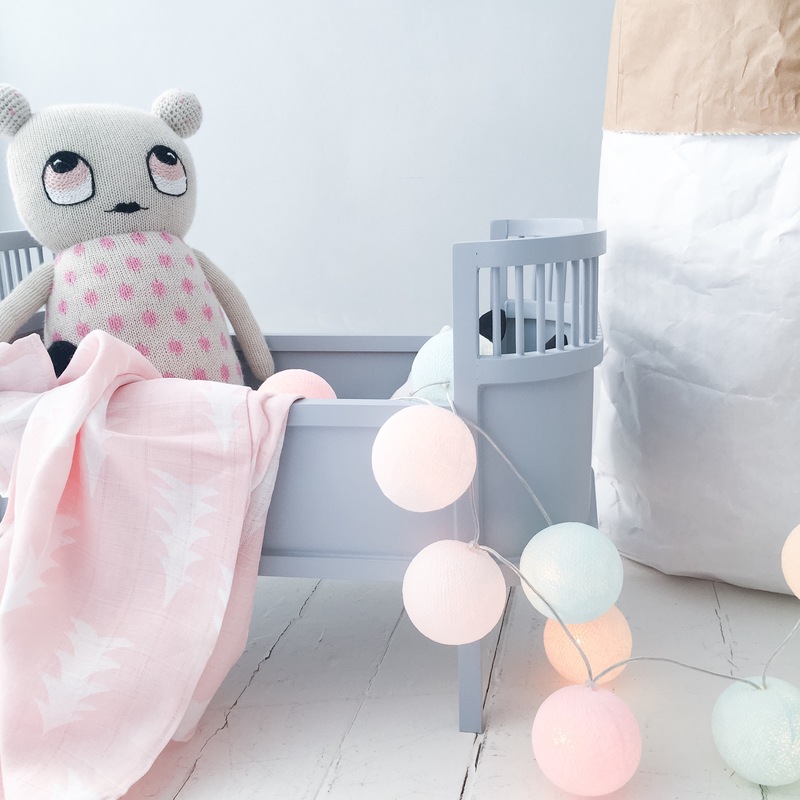 I’ve put together a few pastel looks from a few of my favourite children’s / interior websites, and some of my own products as they work so perfectly in tandem. I’ve also been working with Cotton Ball Lights which have so many different and beautiful colour options in their online store. For the perfect pastel base, use simple white walls, or a pale grey like we have. In this look, I’ve used a string of cotton ball lights in pastels from cottonballlights.com/uk (used throughout) to tie in lots of pastel hues, so that the look doesn’t get too ‘pink’ ! Pink and grey makes a perfect combination, and I’ve used this beautiful dolls bed from This Modern Life as a sweet accessory. The monochrome dolls bedding is from Willie and Millie which has a little cover and pillow, the perfect size for the little cot. 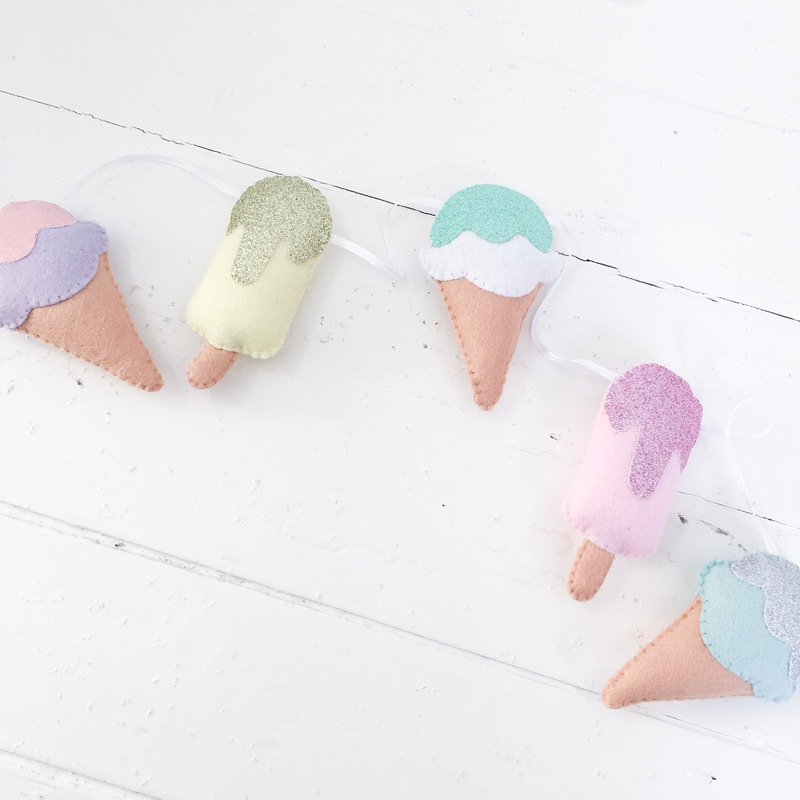 The Icecream garland is my pastel Icecream garland available to order in my Etsy shop each Friday. Filling a paper bag with toys lends a more rustic contemporary look to a children’s room, and I’ve filled it with some of our little toys. I never planned to get so ‘girlie’ but adding greys and whites keeps this look well away from sickly territory. Personally I’m not a fan of beiges and champagne colours, but wanting a soft look to baby’s area, the greys and pastels are ideal. 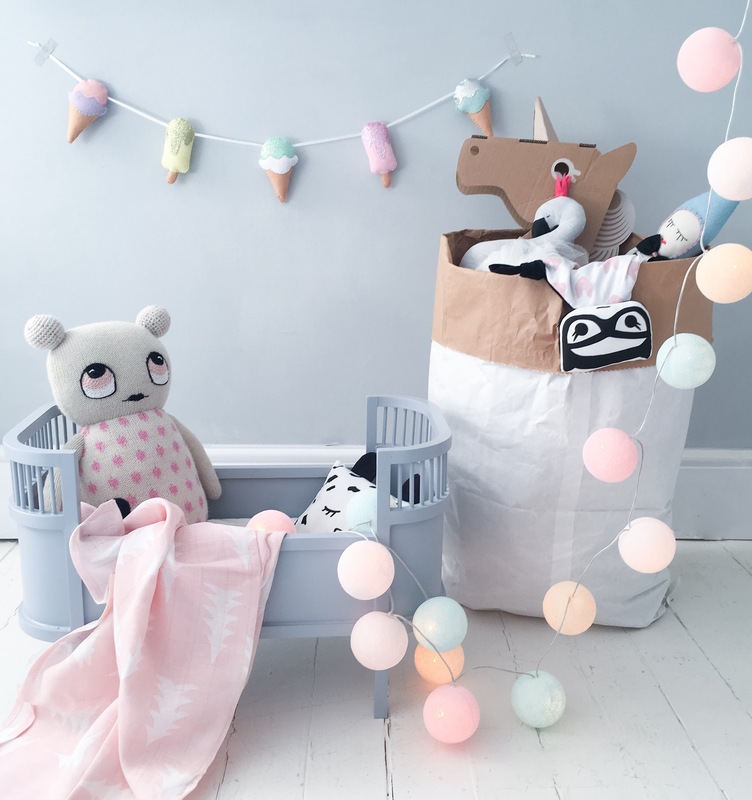 Our cotton ball lights are perfect for creating a warm cosy space by night, and a soft light for night time feeds, and by day they are another pretty accessory. I’ve also created a little shelf area using white ash String Shelves from Utility Design which are ideal for displaying our trinkets. I try and keep a balance of whites, greys and pastel touches so it doesn’t become overbearing. 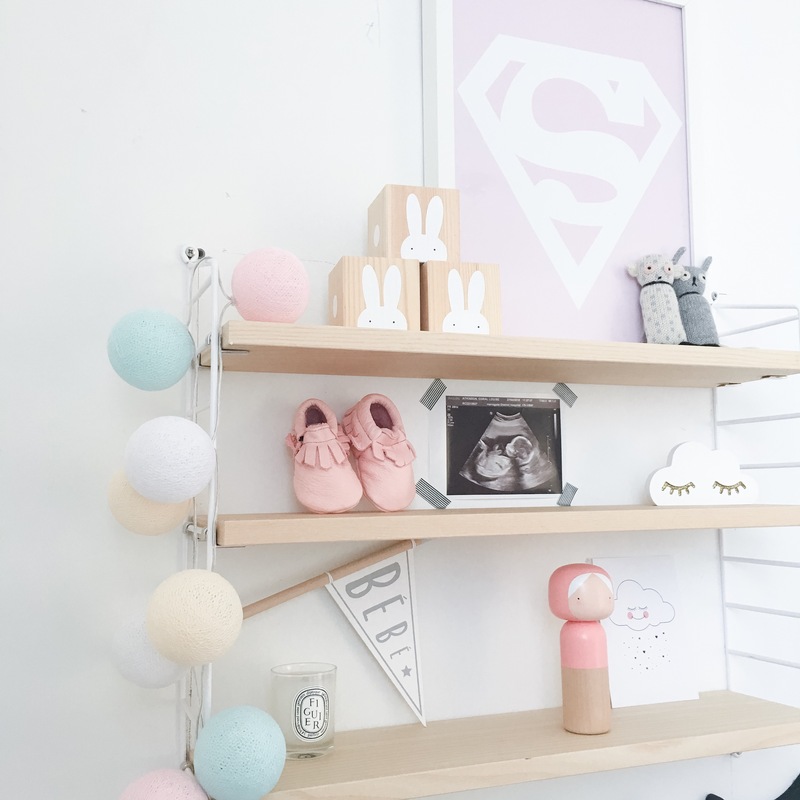 I’ve also started to collect sweet baby accessories and clothes from some of my favourite shops. These pink moccasins are made by Wolfie and Willow and they are the softest chrome free leather. These little socks are from Archies Boutique and are by Petit Pattes who make the most beautiful baby gift or treat. 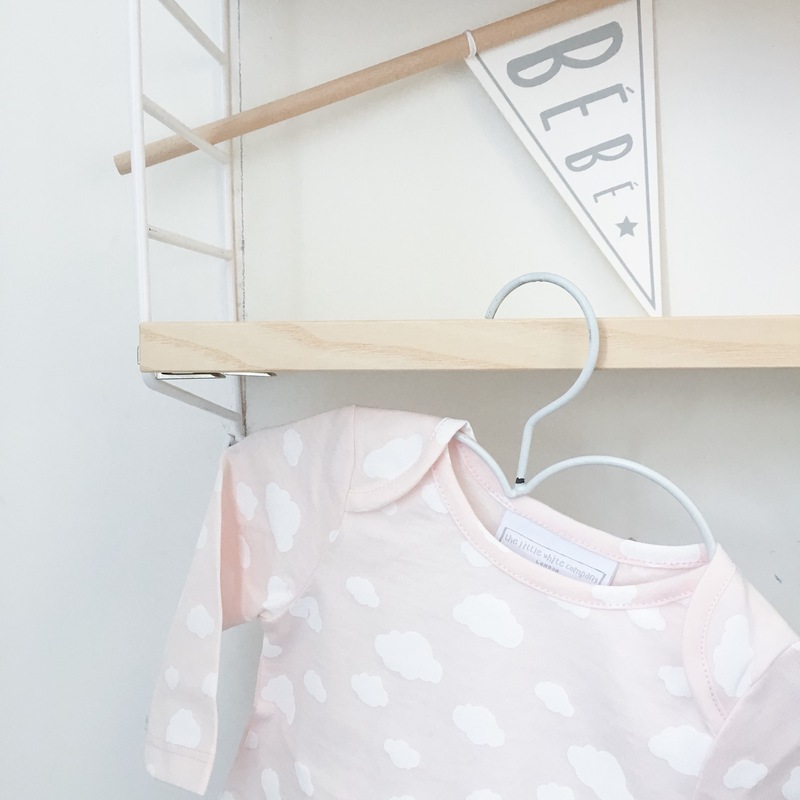 I also found this sweet cloud top and matching leggings at The Little White Company which goes so well with our other ‘cloud’ items which are dotted about. 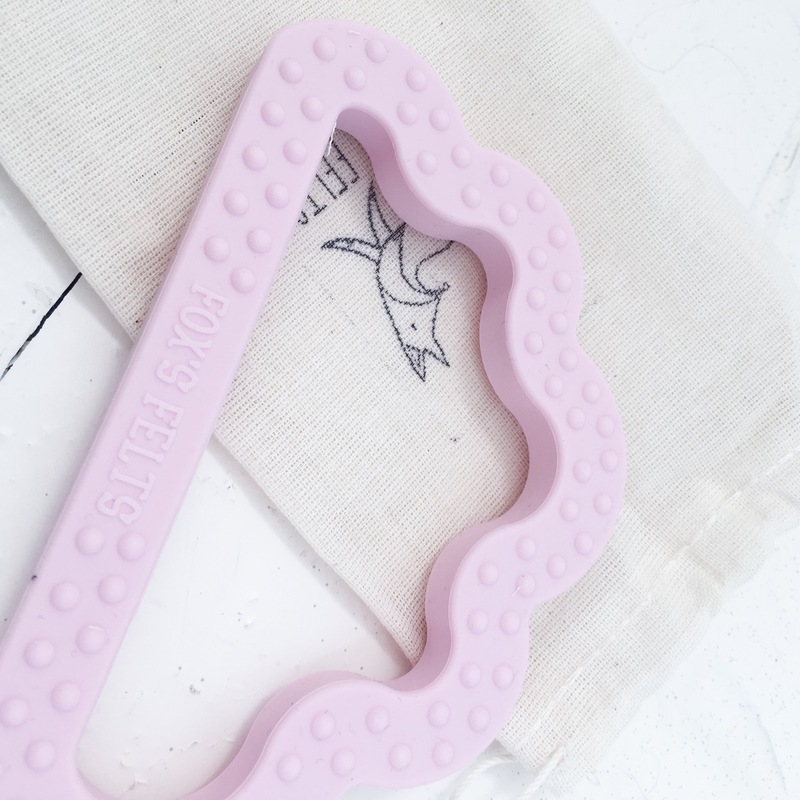 I found this little pink teething ring at Archies Boutique too, perfect as a gift or to stash away in my case! 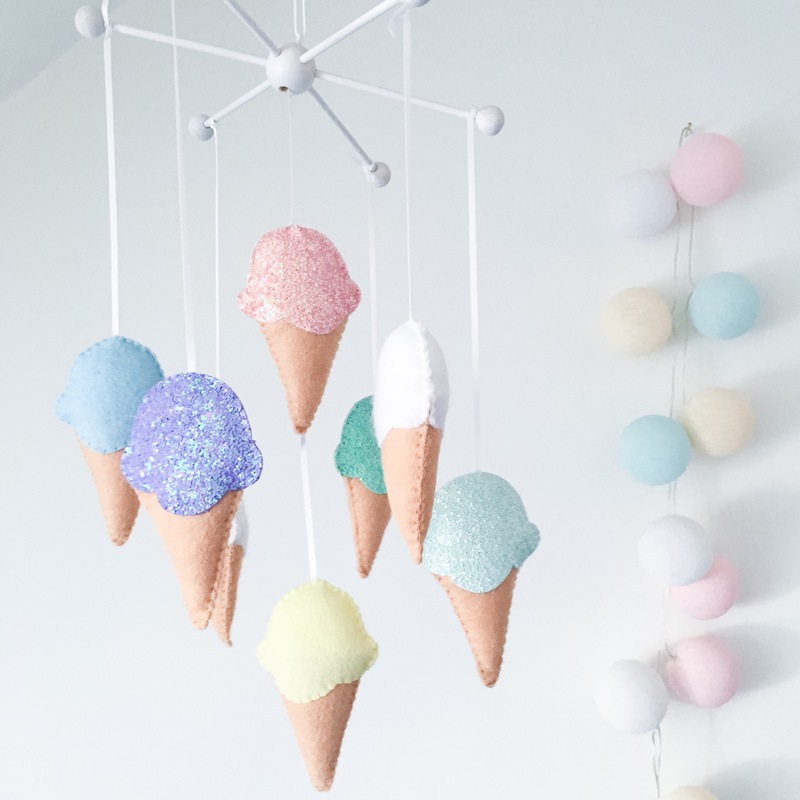 Finally, I’ve made a new mobile style with sparkling and felt icecreams which will launch in my Etsy shop on May 6th.